And now to see what Nika is up to! Nika is…not reacting all the great to the end of the previous story, but at least she’s off doing good things? Not having the best effect on Seren, though. As you can see, we’re back to proper guest pages instead of half-guest pages with this week’s update! This amazing page was drawn by our friend Erin Mehlos. If you like what you see here (and if you don’t I’m a bit worried for you), go check out her comic, Next Town Over. You’ll get even MORE great art there! She’s also on Twitter and Tumblr, plus she has a Patreon if you want to help her keep making cool things! Speaking of supporting artists making art, this is the part where I once again plug OUR stuff. So yes, you CAN get Of Stars and Swords Vol 1: The Mad Lord on Comixology! 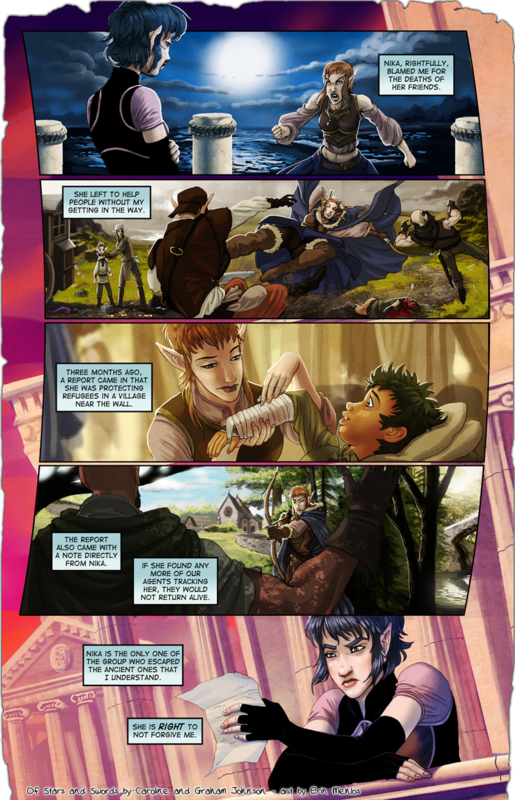 It’s $9.99 for all the first story arc with new and updated art in one nice digital place! If you made it through all of this, here’s some MORE Of Stars and Swords art and a look ahead! I’ve mentioned these last 3 pages are us catching up with the old cast and…well, when we get moving on the second story, Seren’s going to have a new group to be annoyed at. If you’d like to get an idea of what this new cast will look like (including more diversity which we’ve sorely needed to have! ), head over to the art blog on this link! Next week comes another guest page and a slightly different topic since we’re all caught up on the old cast.